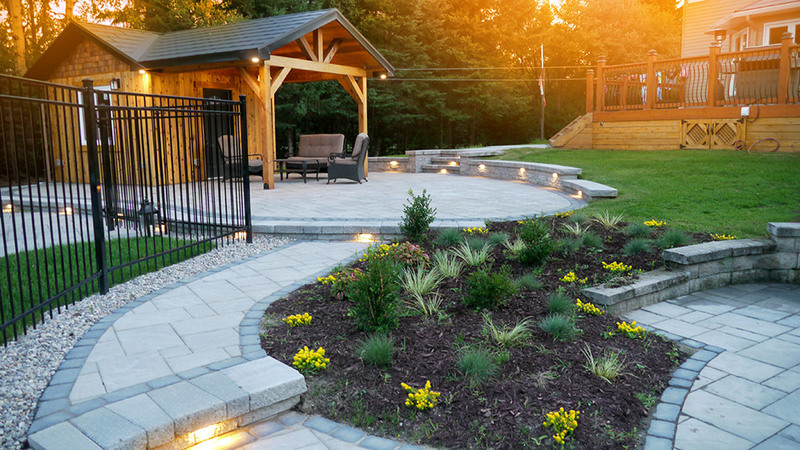 One of the hottest landscaping design trends in Ottawa this year is making outdoor spaces feel truly as though they are part of your home. Homeowners have moved beyond merely maintaining grassy backyards and shifted towards incorporating that space into our everyday lifestyles. Whether you’re into making a bold statement or simply want to enjoy the comfort of a warm fire by the poolside, the path to creating an ideal low-maintenance outdoor living space is hardscaping. Ottawa’s best landscape designers are finding new ways to push the boundaries of what it means to hardscape this year, with the emphasis consistently being on one of our most favourite and popular landscape centerpieces of all – the swimming pool. Exact Landscapes’ clients have always been the type to think outside the box, and we’ve enjoyed pushing our creative imaginations and capabilities farther each and every year we’ve been in business. 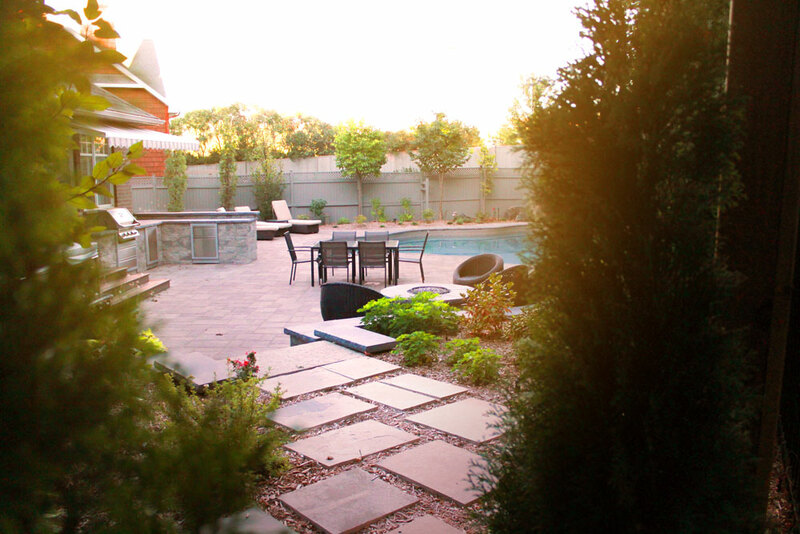 Here are some ideas our clients pursued for pool hardscaping recently. Feel inspired? Want to springboard a new idea? Give us a shout! 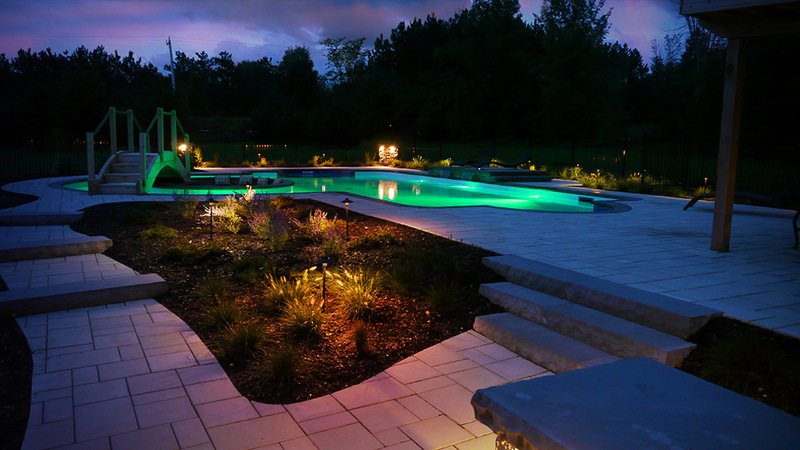 This backyard resort in Kanata North combines fire and water to create a dynamic environment for any occasion. Featuring a fireplace positioned INSIDE the pool, this design relies heavily on meticulous hardscaping to achieve a striking balance of both texture and colour. Our team was proud to collaborate with the talented team at Pool Builders to create this luxurious space. Outdoor living spaces that combine convenience, luxury, and play, like this one we worked on for a family in Kanata Lakes, are made possible with extensive hardscaping. Here, interlock integrates the poolside with the surrounding outdoor kitchen and lounge areas to create a flawless and unified look, while a hidden pathway into the garden brings a natural feel to the space. Hardscaping is about shaping a landscape, but the best landscapers also know how to respect a space’s natural beauty. Deciding where to carve out dymension with integrated stonework, and where it’s best to leave things looking natural, is where great landscaping design shines. Here, our team used hardscaping to create a lush but casual walkway from the pool house to the pool. While not strictly considered hardscaping, pool fences are necessary to bring both privacy and safety to your pool area. 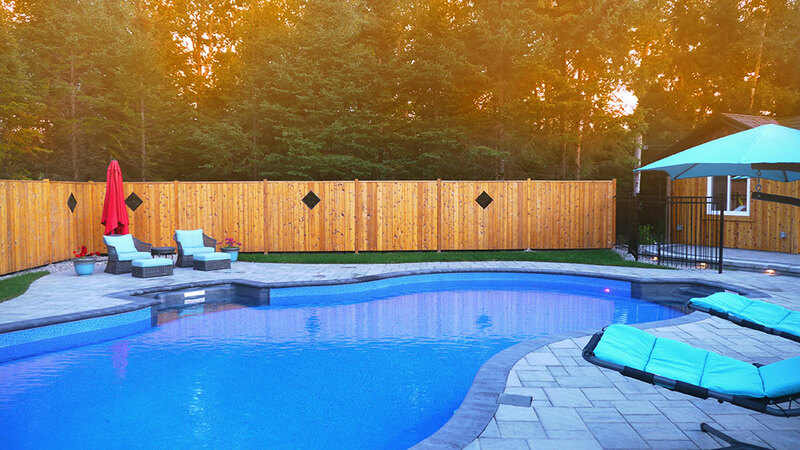 Instead of choosing standard chain link or aluminum fencing, this family decided to bring warmth and refinement to their space with this beautifully designed, diamond shaped cedar fence. Pergolas and shade structures have been desired poolside features for decades, but today’s homeowners are getting both crafty and creative in their unique visions for both how they are constructed and where they are placed. 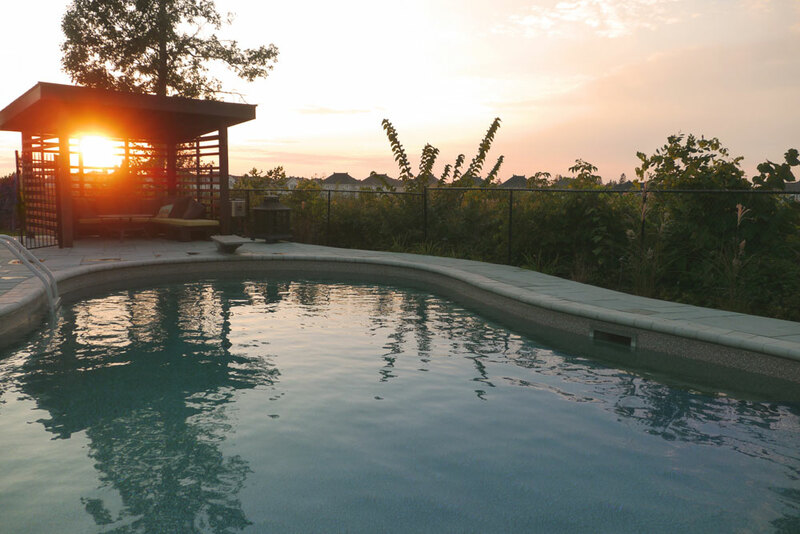 Here, a custom wooden pergola is placed in front of the setting sun with a view of both the pool and surrounding landscape. Have hardscaping ideas for your pool? Contact us for a consultation.